*Christmas Time is the Perfect Time For Love. A guest collection of loved - award winning artist - Tammy Trent - Don Moen - Babbie Mason - Stephen Marshall - Reggie and Ladye Love Smith - Pam Thum - and others. A Little Boy's Prayer will have you laughing, crying and believing that just one answer touches us all. When a man's life is forced up a tree, the perfect image he's clung to unravels until he's fit with the very thing he's longed for and yet hid from. This is a full color vibrant, heartwarming 36 page book that you as parents- grandparents- and friends will enjoy reading to your little ones. Sit down - grab a blanket and cuddle on the couch and read a little story that will warm the heart. 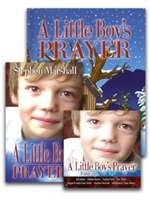 A little boy's prayer will have you believing that one answer touches us all and now life has only just begun.